IForm the headboard (A), shown on Drawing 1, by edge-joining two or three pieces of W-thick stock, making a 12x12" panel. After the glue dries, trim the panel to 11W square. 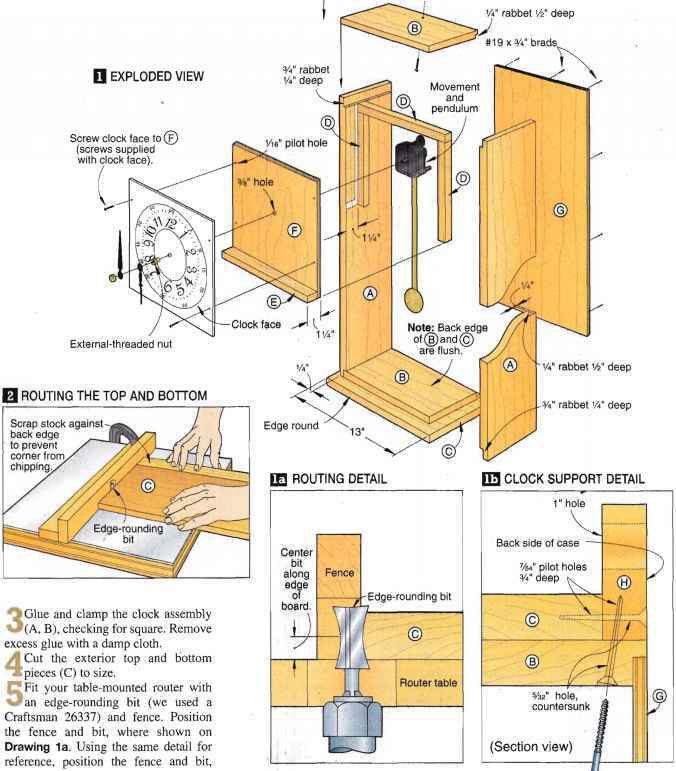 2 Mark the centerpoints for the three large holes on the headboard panel, where shown on Drawing 3 on page 124. Next, mark the centerpoint for the top 61/s" radius. Using a compass, draw the arc. Then, using the dimensions on the same drawing, mark the centerpoints for the four Vt" counterbores on the outside face of the headboard. 3 Bore the decorative holes in the headboard. Using Forstner bits, we drilled the center hole first, and then the two smaller holes. Next, drill and counterbore the four screw holes, where dimensioned on Drawing 3. 4Bandsaw the headboard radius just to the waste side of the line, then sand to the line.